It’s Christmas time, but no time to compromise. It’s really Christmas 365 days a year to the believer. We have the gift of Jesus and the power of standing on His Word. We must stay in peace to keep our walk with the Lord pure and holy. And learn to stand in agreement with GOD in prayer. We must heed the warnings of God however He sends them…through a check in our spirit, an uneasiness or burden we sense, a dream, vision, through His Word, or voice. Never ignore the warnings and promptings from God. Keep your heart pure and your feet shod with the gospel of peace at all times so you can hear the Voice of God. When was the last time you heard a message about feet? You might be reminded of the time in Scripture when Jesus washed the feet of His own disciples. Some of you might think of walking on sand in the heat of the day and coming in to a refreshing bath. Some of you might be thinking about coming in from a ski trip out in the snow—with your feet by a fire and a cup of hot chocolate. The Apostle Paul did not avoid the subject of feet. He made feet a focal point of one of his most powerful messages. We must learn to stay in peace…with our feet shod with the gospel of peace, at all times. We must not allow the wind and waves of life to get inside us…no matter what we are facing in life. No matter what battle is raging, what attack has happened, or what you are seeing all around you, don’t allow the raging seas to get inside your heart. Keep your eyes focused on Jesus and don’t allow the enemy to abort God’s plan for your life. Look at what Scripture says about standing firm. You can read about it in Ephesians 6:10-18—about the armor of God. Let’s take a closer look. The Bile says it four times in four verses (verses 11-14 NIV), Paul declares that the armor’s purpose is to help us “stand,” “stand against the devil’s schemes,” “stand [our] ground,” and “stand firm.” Armor would be incomplete without shoes. Paul identified this as “the preparation of the gospel of peace” (verse 15). Paul knew that we would need to be equipped and have a firm foundation in Christ to face opposition. And you get rest assured, if you are still breathing, you will face opposition. The Roman soldier’s sandals had a long spike at the heel of the shoe. The purpose was to allow the warrior to plant his feet firmly in the ground when an opponent approached. The soldier would have an obvious advantage with his feet secured in the ground. He would be able to stand in the face of opposition and not be moved. This part of his uniform enabled him to keep his footing even in the face of the enemy and danger. That is precisely what our Father God wants for every one of His children today: the ability to stand firm in the face of troubles and opposition. This is possible when we plant our feet on a firm foundation—the foundation of faith in Jesus Christ—the Solid Rock on which we stand. That’s what happens when we are in a life or death situation, we can cry out to God for help. We know WHO to turn to when problems arise because we know WHO we are IN CHRIST and we belong to HIM. We must learn to live by faith. With the evil that has escalated across America and the unrest across the nations, it is imperative that we are secure in Christ and learn to stand firm in Him. We are also to be identified by the fruit of our lives—the way we act. (See Luke 6:44 and Matthew 7:16). The Holy Spirit has graciously given us love, joy, peace, patience, kindness, goodness, faithfulness, gentleness and self-control. (Galatians 5:22-23). When we are faced with extreme adverse circumstances, any of us can act inappropriately. Often times our fruit can be anger, conflict, sorrow, defensiveness, harshness, impatience, and even rudeness. We could say it may be anything but self-control. Oh, and let’s not get in the seat of judgment and pretend to know how it feels to walk through a crisis of one sort or another. You really don’t know how you would respond or react till you walk in the same situation. So ZIP IT now….God doesn’t call us to be jury and judge. We are called to pray for one another. We also must not pretend the enemy does not exist…like an unwise person who walks up on a python and thinks it is okay to play with it. We are not called to ignore the enemy or his tactics. We must know that the deceiver can use our wounds from the past, agreements we have made, weaknesses in our flesh, and the lies we have believed of the enemy to keep us locked in a negative cycle of sinful behavior and wrong choices. I can assure you that if you have any knowledge of God at all, when faced with a crisis, most people will call upon God. Even America called on God in prayer right after September 11th…and churches were filled to overflow for about three weeks. Then life went back to what the world thought was normal. But it is anything but normal. We must seek godly counsel and wisdom, along with prayer and ministry to find lasting help. For immediate help, prayer is the first thing we must do. No matter if you personally believe it or not, Satan is real and so are his evil tactics. He uses a hierarchy of fallen angels for his evil purposes because he doesn’t have the authority, power, and abilities of God. Satan is not omnipresent. And don’t think Christians cannot be harassed, oppressed, or afflicted. If you think that way—you are already deceived. The enemy comes like a roaring lion—seeking those he may devour. So what can we do when it is obvious that we are being attacked? What can we do when we are acting out in ways that are not in our character as a born-again believer of Jesus Christ? Get on our knees in prayer—cry out to God for help. Pray Psalm 91 and Psalm 59. Say them out loud. The spoken Word of God cannot return void. What else can we do? Put on the armor of God. (See Ephesians 6:11-18) The shield of faith, the helmet of salvation that guards our mind, will and emotions, shoes of peace, and the belt of truth are defensive weapons. The Word of God is an offensive weapon. We need to stay close to God…read His Word and study the Bible on a daily basis. Our other offensive weapon is prayer. Choose to cultivate a life of prayer that goes far beyond praying over meals and crying out to God only in a crisis. Talk to God all day long. When you wake up in the night time, tell the LORD that you love Him. Talk to Him throughout your day. Each day of life is a gift from our Father God. The Bible and prayer will do more to help show the true fruit of who we are than anything else we can do in this life. We must ask God to help us cast aside any of the rotten fruit of Satan and enjoy the precious fruits of the Holy Spirit in our lives. Choose to enjoy Christmas—365 days a year. Choose to enjoy family and friends. Make wise choices and stand firm—planted on the solid Rock—Jesus Christ. GOD’S PRICELESS TREASURE (How To Overcome Challenges, Be Transformed and Know Your Purpose)…learn to move from drama to destiny. Learn that you can make right choices and change your life through turning to Jesus Christ. You can overcome the pain of divorce, heartache and loss. Learn to triumph through trials and tribulation by turning to Jesus. A LEAP OF FAITH (25 Days At The Mercy Seat)…the full account of God raising my husband from death, healing him from two strokes, and the walk through two open-heart surgeries. Read the amazing ways the Holy Spirit led us—through our son’s first open-heart surgery….and through the loss of a loved one—my daddy. The amazing ways God led us will encourage you and give you hope to believe God for yourself, for your loved ones and for the world around you. THE MIDNIGHT HOUR (Will America Turn Back To God?) …a must read for ALL! When you are in a situation and you don’t know what to do, you need to be able to hear the still, small voice of God. One of my prayers is this: “Lord, let me hear You at the slightest whisper at the door of my heart.” I’ve been praying that prayer for many years. It is highly important to be able to hear God at the slightest whisper of His Voice. It is for the saving of lives, to thwart the plans of the enemy, and to change destinies. God still speaks. He speaks to us however He knows He can get our attention….He speaks to us through dreams, visions, through His Word, through other people and by His still, small voice. God sent His Holy Spirit to help us here on earth. 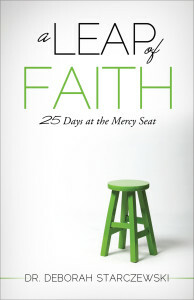 If you are having a hard time believing God for something or someone right now, take time to read A LEAP OF FAITH (25 Days At The Mercy Seat)….the full account of God raising my husband from death, walking with us through his two open heart surgeries, and how God healed him from two strokes. You won’t be able to put the book down. Within the pages of the book, you can read about how God spoke to me in natural ways and how obedience to His instructions brought about supernatural results. AND MORE IMPORTANTLY….it will for you as well. We live in such a time of crisis in America that it is vital to hear God. The nation is divided. Jesus warned us long ago of what we are witnessing now. Jesus wants us to overcome and to step out and take territory. We must shine the light of God to the world—not hide out in seclusion. Remember the account of Elijah in the Bible. God brought Elijah out of the cave and told him to stand on the mountain (see 1 Kings 19:9-12). While Elijah stood there in obedience to God, a mighty wind came, then an earthquake, then a fire and God was not in any of those. Finally…there was a still, small voice….the Voice of God. Trust God…even when you don’t understand. God will reveal the answers to the things you don’t know in time. Refuse to back off of the Word of God. God does not lie. He always honors His Word. He cannot lie…He is God. God will reveal the answers at the right time. God is at work behind the scenes on your behalf. Miracles are being set in motion in the waiting. Take time to hear the still, small voice of God–His whisper. Tell the world about Jesus…He is coming back! GOD’S PRICELESS TREASURE (How To Overcome Challenges, Be Transformed And Know Your Purpose)….move from drama to destiny, pain to purpose, a mess to a message of hope for others. You can turn that trial to triumph through turning to Jesus Christ. A LEAP OF FAITH (25 Days At The Mercy Seat)…the ways the Holy Spirit led us will keep you turning the pages. God raised my husband from death, healed him from two strokes, and walked with us through two open heart surgeries. You will be amazed at how God goes to extreme detail in the book. It will give you increased faith to believe God for anything. THE MIDNIGHT HOUR (Will America Turn Back To God? )….a must read for all. Makes a great gift for friends, family, and anyone else. Great stocking stuffers. Available on Amazon, Barnes & Noble, www.starministriesinc.com etc. Jesus cursed the fig tree and it withered up—which represented the Spirit of Religion that blinded Israel. Once Jesus gave His life on the Cross and judged Satan, the Church grew expediently. (Fig tree account is in Matthew 21 and Mark 11). Jesus cursed (judged) the tree. Thank GOD Jesus judged Satan, and as believers, we win in the Courts of Heaven. God is our Judge. He has the final say. But be reminded, don’t be like Satan and be the accuser, one who betrays people, or withholds information that could set someone free. Don’t look for something to blast someone out about. Satan entered the heart of Judas and he betrayed the Son of God. Jesus said it would have been better that Judas was not born. In the natural, when anyone steps out to take territory from the enemy, the accuser looks for something to accuse. He will study your past—and can move in the hearts of people who are walking in darkness to be used as an accuser themselves. He can even work through believers. For example, when a person steps out to run for any political office—Satan begins to operate through people to study their past, to look for something or someone to accuse to damage that person. Satan attacks anything and anyone who is Kingdom minded and taking territory from him. We must learn to attack sin and systems. Good people can get into office and have right heart attitudes, but get caught up in the system. It’s not too late for the CHURCH to arise and stand against the enemy. We must unite together in prayer and walk in God’s love. I have often heard that the church is the only army that attacks her own. Rest assured—GOD HIMSELF judges all. He wants the church (the ecclesia) to step out in her God-given authority as the Body of Christ—soon to be His Bride at His return—and make decrees against the spirits operating behind the scenes. You might be asking…how do I do that? First, repent from any sin in your own life (wrong thoughts, deeds, actions). Repent for all wrong heart attitudes and motives. Repent for your family bloodline and history of sin—unknown and known. Repent for all negative confessions about yourself or someone else. Repent for not forgiving yourself—because if you are born-again, the enemy will try to heap shame and condemnation on you because of your past. If you are born-again, you are BLOOD BOUGHT by THE LAMB—JESUS CHRIST. There is great power in the Blood of Jesus. The same resurrection power that raised Jesus up lives inside you as a believer. The Blood of Jesus answers every accusation from the Courts of Heaven. God Himself has the final say. Don’t fall for the trap of coming alongside anyone who purports to be a Christian but destroys the Body of Christ. We must arise as the army of Christ. Don’t turn on one another and be used by Satan. Stand strong, pray for one another, love one another—realizing that every single person on the planet is like Barabbas…the one that was freed instead of Jesus. That is a picture of our redemption in the natural. I don’t know what you’re walking through—but I pray GOD will give you such tenacity and boldness to find your five smooth stones to face the giants in your life. Run toward the enemy knowing the GOD of all creation is with you. Pray, worship, inquire of the Lord, obey Him…Pursue the enemy, and without fail, you shall recover all. (1 Samuel 30:8). Available on Amazon, www.starministriesinc.com and other on-line distributors. Can order in bookstores as well.